My son and I put out a few bottom jugs and left them out over night. We used live bream for bait as we were fishing for yellow catfish. The next morning we went to check our rigs and this one had traveled about 1/2 a mile down river where we found it. My son grabbed the jug and began pulling it up. There was about 45 feet of line to retrieve and this monster wasn't giving up. Finally, he got him to the surface and I put the net under him, but he was too big, so he laid across the rim of the net. Suddenly, he jerked his head and the hook came out of his mouth while resting across the rim of the net over the water. I reached and grabbed him by his mouth and jerked him into the boat. Hey Jerry, that definitely was a close call. Had it not been for your quick reaction to grab him, he most likely would have swam off and got away. 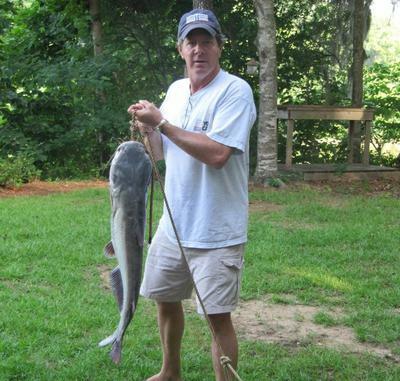 Nice job getting that big catfish into the boat!